France won the 2018 World Cup as they beat Croatia 4-2 in Moscow, in the process banishing their Euro 2016 demons. Deschamps’ side struggled to find their feet in the early exchanges, and Croatia were surprisingly energetic as they had 65% possession after 15 minutes. France were unable to find their feet on the biggest stage, which was startling given Croatia had played three consecutive sets of 120 minutes in failing to win any of their knockout games inside normal time. Despite Croatia’s early dominance, France’s fiery razzmatazz in attack remained a threat, and Zlatko Dalic’s side were warned of this as Mbappe broke into the box just after 15 minutes. France somehow took an early lead from the free kick that ensued after Croatia failed to clear and Antoine Griezmann fell under little contact. Mario Mandzukic, whose clever finish put his side through to the final, was the unfortunate recipient of a shrewd Griezmann free kick, as he headed the ball into his own net. It was Ivan Perisic who gave them hope of coming from behind to win for the fourth consecutive game, as he equalised before the half-hour mark with a wonderful swerving strike with his weaker foot. Perisic also scored the leveller against England four days previously, and it was a fully deserved goal for a team that had taken to the highest stage with aplomb and chutzpah. The 2018 World Cup was the first to include VAR, and it seemed fitting that France’s second goal would come from a penalty awarded through the technology. 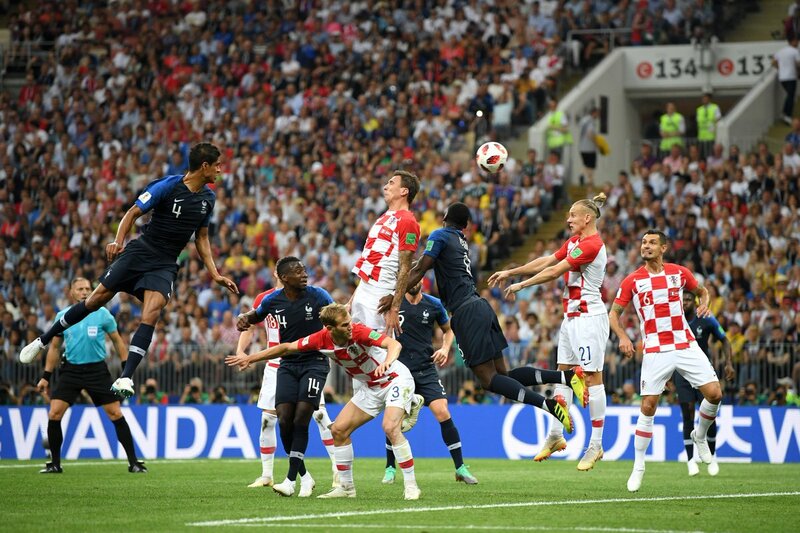 Though Perisic’s handball was not deliberate, it was definitely negligent, and Griezmann made him pay in scoring his fourth goal of the tournament. Deschamps’ defence was on the ropes before the interval, and Croatia had numerous opportunities to once more level the scoreline, but nevertheless France took a 2-1 lead into the break. Croatia began the second half in similar fashion to the first, as Ante Rebic forced a fingertip save from Hugo Lloris inside two minutes. But France gradually grew into the half in a similar fashion to before, and Kylian Mbappe was unleashed on the left by a wonderful cross-field ball from Paul Pogba. The Manchester United midfielder then caressed the ball home past a stranded Subasic on the second attempt. Coming back from two goals behind with just 30 minutes remaining proved to be a bridge too far for Croatia’s team of exhausted fighters, and the game was well and truly up when Mbappe – who in the process became the first teenager to score in a World Cup final since Pele – hammered the ball past Subasic from outside the area. Hugo Lloris did give Croatia a glimmer of hope in giving the ball away for Mandzukic to tap in, but any attempts to make it a nervy end to the game for France were futile, and Lloris was able to guide his team home and would later lift the trophy. Croatia could potentially feel aggrieved with the nature of the first two goals: Pogba was offside for the opener (though it’s arguable whether he was interfering with play), and the VAR induced Griezmann penalty was incredibly harsh. Deschamps has come under heavy criticism this tournament for an assumed lack of tactical aptitude, but this team has come along way since their draw with Luxembourg in September. After the first game against Australia, Deschamps opted to bring in Olivier Giroud for Ousmane Dembele, which allowed Blaise Matuidi to drop into midfield in defence, while acting as an attacker going forward. This system switch allowed France to adapt their game against the stronger sides. Before the tournament, it was always known that if France could begin to perform as a team, they’d be a match for anyone. 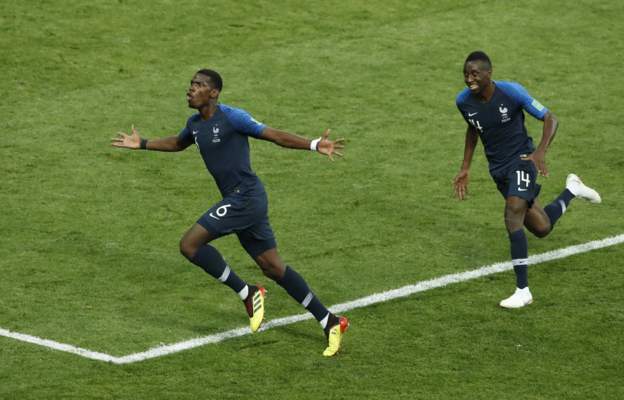 Few predicted it could happen, but seeing Pogba – a man who dislikes defending at club level – work as hard in defence as as any other player was worthy proof of Deschamps’ success. Mbappe was the star of the tournament, and though his transfer to PSG last year made him the world’s most expensive teenager, it is now an undeniable truth that the 19 year old is well and truly a world star. It was Croatia’s midfield which won them the game against England on Wednesday, but when they came up against stars of a similar quality in Paul Pogba and N’golo Kante, they were bullied out of the game by Pogba’s power and pace, though they did manage to force Deschamps to replace Kante before the hour mark. Croatia had played three consecutive sets of 120 minutes as they failed to win any of their knockout games inside normal time, and it showed as they tired after half-time, and looked lethargic and fatigued on the biggest stage. Though France are now World Champions, there is no doubting that this team still have work to do if they’re to achieve their potential of dominating world football over the next few years. Deschamps’ counter attacking system doesn’t seem to get the best out of the star players that he has at his disposal, and surely he must find a place for either Dembele or Thomas Lemar on the wing. But for now, none of this matters. Because Frenchman across the global will celebrate the success of a team formed of men born across the globe. Previous Post England’s exploits in Russia were surprising, but what good did they actually do?